La Guadeloupe est à la fois une région d'outre-mer et un département d'outre-mer (numéro 971) français. Ce petit archipel des Antilles (mer des Caraïbes) se trouve à environ 600 km au nord des côtes de l'Amérique du Sud, et 600 km à l'est de la République dominicaine. 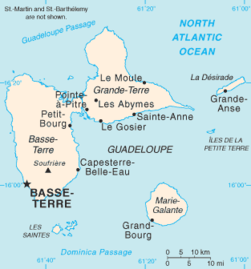 The Region of Guadeloupe is an archipelago located in the eastern Caribbean Sea at 16°15′N 61°35′W, with a total area of 1,780 square kilometres (687 sq. mi). It is an overseas department and an overseas region of France. As with the other overseas departments, Guadeloupe is also one of the twenty-six regions of France (being an overseas region) and an integral part of the Republic. As part of France, Guadeloupe is part of the ► European Union. it lies north of ► Dominica and south of ► Montserrat and ► Antigua and Barbuda. More images Guadeloupe - Guadeloupe (Category). This section holds a short summary of the history of the area of present-day Guadeloupe, illustrated with maps, including historical maps of former countries and empires that included present-day Guadeloupe. The island of Karukera is discovered by Christopher Columbus in 1493. He names the islands Santa Maria de Guadelupe de Estremadura. In 1635 France acquires Guadeloupe and establishes it as a French colony. From 1759 until 1763 and from 1810 until 1816 the island is occupied by the United Kingdom. In 1946 Guadeloupe becomes a French overseas département and is ruled as part of mainland France.